Great app! Is just what I was looking for, very simple to use. Love it! Best weight controll App ! & everything about it! Love how it tells you your weight and your bmi.. Cool. I've tried quite a few weight track apps. This one looks awesome, it's easy to use and you can add notes. It has all the basic functions to keep track of my weight, Bmi, etc. Loving is app! Just what I was looking for. Simple, private app to track weight loss/BMI and to set a target goal. Can add prior information by date. Easy to use and view. Pretty nice app! Simple, elegant and useful. Love it! Quick input. Shows my weight gain progress. That's all I need! Easy to use!! Can be entered in kg, lbs or stone!Also asks for your daily mood! Nice and easy too use, good job! Habe schon einige ausprobiert. Diese hier ist einfach die umfangreichste und schönste im ganzen Store. Freue mich schon auf das iOS 7 update. Das wird der Hammer! I absolutely love this app. Simple yet having a nice design to layout the weight in everyday list. Awesome! Thanks for this! This ap is fantastic for keeping a daily diary of feelings, weigh recordings, your BMI and giving you a nice graph of how you are getting on. I use it daily and look forward to updating my progress and looking back over my journey. This is a lovely app - it's easy to use and does what I want.Weight can be measured in stone and fractions of pounds - which is nice.The only things I'd like to change are to have a countdown to the goal (rather than just the goal displayed), and the days off the week shown - so when I look back through my timeline I can spot patterns in gain and loss.I highly recommend this app. Can't fault it at all. Does everything I needs and I love the fact it tracks my bmi. I love that you can add the mood you're in so you can look back and remember how you felt. Also the notes are great. Everything you need to track weight loss/gain. Ideal for whoever is on a diet or has just started a fitness plan and intends to lose, maintain or gain weight. Weight QuickLog.me is an app that allows a daily register of your weight and body fat percentage, while automatically calculating your BMI (Body Mass Index). 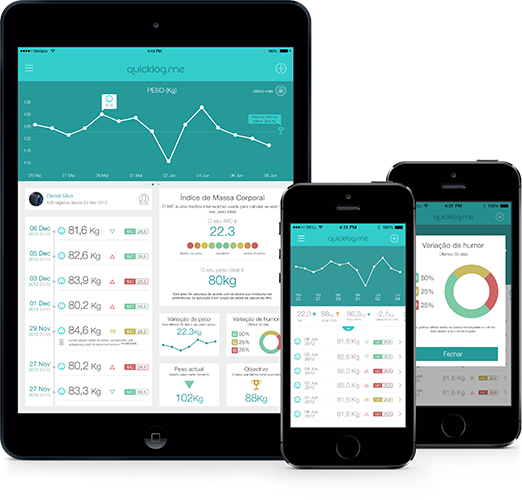 Weight QuickLog.me stands out because of its simple and intuitive interface, its trendy and appealing design. Synchronize your data between different iOS and Android devices. This way, your data can, for example, be added on the iPhone and viewed on the iPad, or even on an Android device. Check if you have the perfect weight for your height. Introduce your current weight and height, and the application will calculate your Body Mass Index (BMI). Export your data directly to your doctor or other healthcare professional. Play it safe, in addition to synchronization, make regular backups by exporting data via email, preventing its loss. The weight and body fat percentage data, as well as current mood, are introduced and represented by graphs, which allow a better perception of progress. Set the weight and body fat percentage you want to achieve. Establishing goals helps you stay focused and motivated to achieve your ideal weight.